There are quite a lot of places to eat around Sidney actually. SheShe and I were just lazy and didn’t want to walk far from our lodging, so we had a few meals at the MickeyD’s next door unfortunately. But we got all dressed up one night for a Wine & Cheese at the local aquarium, so we decided to head out for a real sit-down dinner at Beacon Landing. It was quite weird though as you seat yourself here. We wondered for a bit how the servers would know that we’ve sat down. But they did. 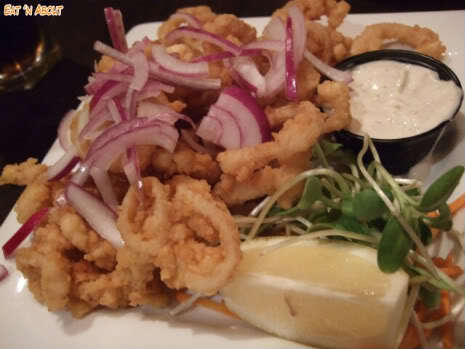 We ordered some calamari to share off the bat ($12). They tasted pretty good, but the rings were quite skinny, which I didn’t like. It, however, wasn’t engulfed in batter and there was actually a lot on the plate, so this wasn’t too bad. SheShe really liked it though, she said “Feels so good to have real food again!”. SheShe’s entree was the Wok Chicken ($15) which was basically deep-fried chicken nuggets in an “Asian” (teriyaki) sauce, on a bed of rice, topped with “Asian noodles”. Oh, and to make it even more “Asian”, they give you a pair of chopsticks. I really dislike when western restaurants try to make something “Asian” by using teriyaki sauce. SheShe said she didn’t really like it either, and didn’t understand why she ordered it. I had a taste too and I didn’t like it, but I was never a fan of teriyaki sauce anyway. 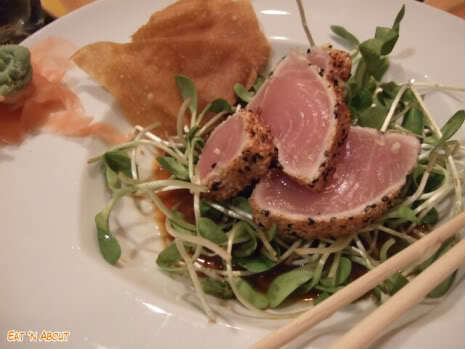 I wasn’t too too hungry so I opted for one of their “Small Meals” too, it being the Tuna Tataki ($16). 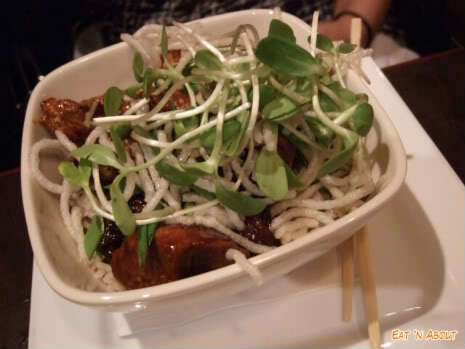 It was served with a ponzu sauce, wasabi and ginger. Oh and chopsticks. This actually wasn’t too bad. The tuna was nicely done (I had worried that they would make it too well-done), and the ponzu sauce was actually very refreshing and light. I consumed everything. I also did something weird, and ordered a side of cornbread for $1.50. Strange combination I know, but I really really wanted it. But alas I couldn’t finish it so I packed it for breakfast the next day. 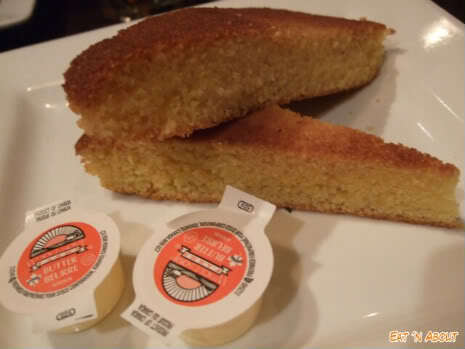 The cornbread was pretty good, nothing spectacular but not bad.